Our short informative walk is the best way how to get familiar with Prague in two hours. By following the Royal Route, which was used by the Czech kings on the day of their coronation, you will enter the Old Town, you will cross the river over the unique 650-year-old Charles bridge and you will visit the most picturesque part of Prague – the Lesser Town. The tour ends with a visit to the Prague Castle where an unequalled view of the city is waiting for you. An ideal tour for those, who want to see Prague in just one day. During this tour you will see the renowned Charles University and the Estates Theatre, the Powder Tower and you will follow the Royal Route directly into the heart of Prague – the Old Town Square with the famous Astronomical Clock. The tour continues past the Klementinum and across the Charles Bridge, right into the Lesser Town. Then you will arrive at the Prague Castle, where the tour ends with a visit of the monumental St. Vitus Cathedral. This tour is perfect for those, who plan to stay in Prague for several days and are interested in seeing the city in a more detailed manner. The first day will begin with an exploration of the New Town, the Old Town and the Jewish Quarter, where you will discover the wonders of a thousand-year-long history of Prague. The crossing of the Charles Bridge will end the first part of the tour. The second day starts with a tram ride to the Strahov Monastery and continues with a visit to the Prague Castle and the beautiful Lesser Town. This special tour will take you into the only Central European Jewish Quarter that survived the Holocaust. You will visit sights connected to the life of Franz Kafka and then you will enter the streets of the actual Jewish Town. You will see 7 ancient synagogues and visit 5 of them. You will enter also the Old Jewish Cemetery with its unique atmosphere. The tour ends in front of the Europe's oldest synagogue – the Old-New Synagogue. This unique tour will take you to Vyšehrad, Prague's original castle. You will visit the beautiful St. Peter and Paul's Basilica as well as Slavín - a final resting place of some of the most outstanding personalities of Czech and European art (i.e. Antonín Dvořák, Bedřich Smetana, Max Schwabinski, Alfons Mucha). Afterwards, you will come down to the river where the main Prague brewery, Staropramen, is located. Here we will see both: the historical and the modern production of beer, the Czech national drink. The tour ends with the tasting of a typical lager beer. 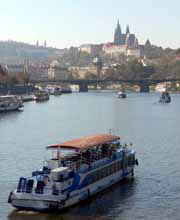 This tour starts with a short walk through the centre of Prague and it continues on a boat. During the lunch, that you will be offered, you can enjoy live music and Prague from a completely different perspective. The guide will comment as you pass the Prague Castle, the Charles Bridge, the National Theatre and much more. The cruise will take about 2 hours. The price includes the boat trip, a welcome drink, lunch and the service of a guide. This is our shortest boat trip. The boat is equiped with an air-conditioned restaurant and a terrace, from where you can enjoy Prague in any kind of wheater. Our guide will comment on the places you pass – the Prague Castle with the St. Vitus Cathedral, the Charles Bridge, the National Theatre and many more. The cruise takes about 1 hour. The price includes the boat trip, a welcome drink and the service of a guide. One of the most amazing experiences that Prague can offer is an evening boat trip. At first the falling sunset will magically transform the panoramic view of the Prague Castle and the Charles Bridge. Later, with or without your guide, you can enjoy the view of other beautifully iluminated monuments as the Lesser Town, the hill of Petřín and the National Theatre. A dinner is offered on board, along with live music to make your trip even more pleasant. The cruise takes about 2 hours. The price includes the boat trip, a welcome drink, dinner and the service of a guide. In Karlovy Vary is located the biggest, the most famous and the most visited Czech spa. Just like those who have visited this city in the past, you, too, will be enchanted by its lovely atmosphere. The guide will walk with you along the colonnades, where you can taste any of the 12 medical hot springs. You will visit the original spa houses and enter the typical orthodox St. Peter and Paul's Church. Then a cable car will take you above the town. In Karlovy Vary you will be like in a dream. The price includes transport, admissions, lunch and the services of a guide. By train, which will take you through the beautiful countryside along the river Berounka, you will arrive near the most famous Czech castle Karlštejn. After a short, yet steep climb, you will reach the castle that was founded by the Czech king and the Holy Roman emperor Charles IV. in 1348. Inside the castle you can admire historical interiors, the bedroom of Charles IV. 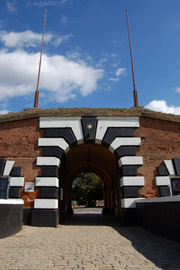 or the castle prison; the guide will also take you for a walk around the fortifications of the upper castle. The price includes transport, admissions and the services of a guide. Kutná Hora is a historical mining town, which used to be the second most important town in the kingdom of Bohemia during its golden age. Today it is under the protection of UNESCO. The tour begins with a visit of St. Barbara's Cathedral and it continues through the romantic Ruthardka street to the St. James' Church. A visit of the Italian Court will take us into an ancient mint, where the famous Prague Groshen have begun to be struck in 1300. The price includes transport, admissions and the services of a guide. Český Krumlov, also is called little Prague, is one of the most beautiful towns in the Czech Republic and rightfully belongs to the UNESCO list. The tour starts with a visit to the castle, the second largest right after the Prague Castle. The guide will then lead you through the historical centre where you can enjoy the city's pictoresque streets, beautiful historical houses and experience many unrepeatable views of this fairy tale town founded in 1253. The price includes transport, admission fees, lunch and the services of a guide. The Nazis established in Terezín a concentration camp and a ghetto that was meant to work as a transfer station to other concentration camps. In 4 years more than 140 000 men, women and children passed through Terezín. 35 000 people died here due to stress, hunger and catastrophic conditions. In order to discover more about this sad part of history, you will visit the memorial, as well as the authentic buildings, the museum and the graveyard. The price includes transport, admission and the services of a guide. For more details and the general conditions, please visit the Prague guided city tours, excursions and boat cruises website. Our hotel finder is searching for prices for double rooms or apartment 2 persons occupancy (double room - 2 persons - is a reference room). Please enter a price for a double room - apartment/night and our finder will find a hotel or apartment with in your budget. If you want to find prices for available rooms other than the double room or apartment for more persons, you will find it in the description & price menu of the hotel or apartment you choose.